Home Tags Posts tagged with "landslide"
A landslide on Indonesia’s main island of Java has killed at least 17 people, officials say. 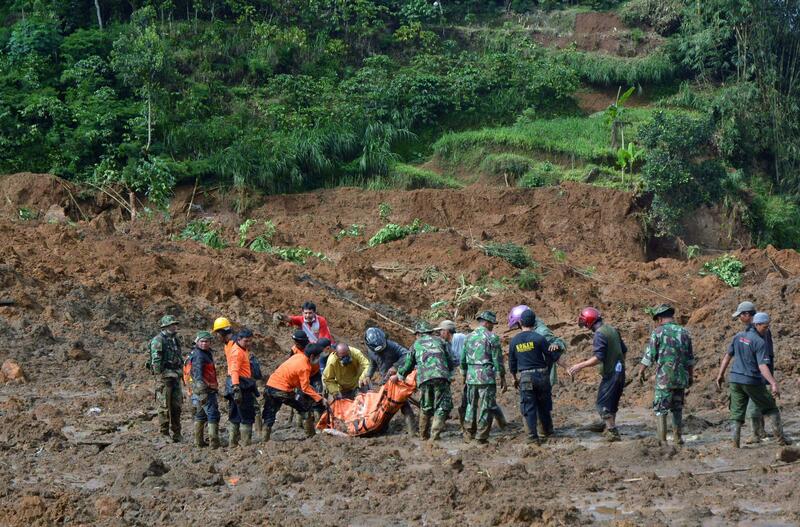 More than 100 people are missing after heavy rain caused the landslide near Jemblung village in central Java. Rescuers have been searching for survivors but a lack of heavy equipment is hampering efforts, with many forced to dig with their bare hands. Disaster agency officials said rescue teams had taken about 40 people to hospital, of whom four were said to be in a critical condition. Relief efforts were suspended on Saturday afternoon after more rain. Indonesia’s national disaster agency said hundreds of houses had been destroyed by the landslide. “Conditions on the ground are pretty tough and we need heavy machines to clear the road that has been covered by the landslide,” agency spokesman Sutopo Purwo Nugroho said. A landslide in a nearby village on Thursday killed one man and forced hundreds to evacuate. Flash floods and landslides are common in Indonesia, triggered by seasonal downpours. Many of the inhabitants of the chain of 17,000 islands live in mountainous areas or near fertile flood plains. Southern Switzerland and northern Italy have been hit by deadly landslides following days of torrential rain. Two women died when a wall of mud destroyed a house near the Swiss town of Lugano on November 16. Over the border, a pensioner and his granddaughter were killed when a mudslide engulfed their home. The heavy rain is expected to continue across the region, and both countries have issued major flood alerts. The levels of lakes Lugano and Maggiore are already dangerously high. Homes and businesses near Italy’s Lake Maggiore have been cut off by rising waters. The region has had more rain in a few days than it would normally expect in a year. The Ticino river burst its banks near Vigevano in northern Italy. 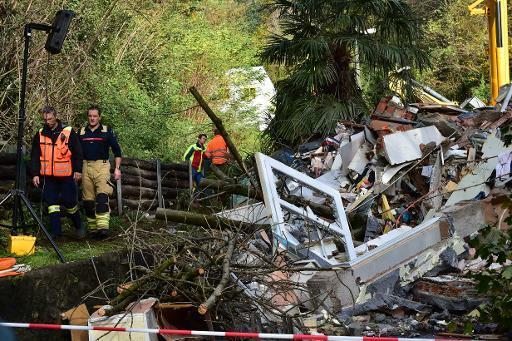 Further north, in the Ticino region of Switzerland, rescue workers were searching for survivors on Sunday after mud swept down a hillside and destroyed an apartment building. Swiss authorities said two women, aged 34 and 38, had died when the mudslide hit the building in the village of Davesco-Soragno. A third person, a 44-year-old Italian, was rescued from the rubble and taken to hospital. Relatives were also mourning the deaths of a 70-year old man and his 16-year-old girl in Cerro di Laveno in Italy. Their house, near Lake Maggiore, was hit by a landslide late on Saturday night. The weekend’s landslides are the latest of many to have hit northern Italy and southern Switzerland amid incessant rainfall over recent weeks. High volumes of water gushed down the Ticino river, seen here in the town of Giornico in southern Switzerland, last week. At least 11 people have been in killed Italy because of extreme weather over the last month. Floods and landslides in Nepal and northern India have killed at least 160 people following days of torrential rains. In Nepal, officials said at least 101 people were known to have died after rescuers found four more bodies. More than 130 people are still missing. In northern Indian states severe flooding after rainfall left at least 60 dead and entire villages marooned. The worst of the rain is now thought to be over. Landslides and flooding devastated rural communities and cut off roads throughout the region. In Nepal, officials voiced fears about a possible cholera outbreak. Rescue helicopters have been deployed to convey emergency supplies to those stranded. More than 1,500 villages are inundated in India’s Uttar Pradesh state where 28 people have died and thousands have been left homeless. In Uttarakhand, cloudbursts and landslides killed 32 and in Bihar at least two people have died. “The flood situation arose following heavy downpours in Nepal, which led to overflowing rivers which originate in the Himalayan region including Tibet and Nepal,” news agency Reuters quoted chief secretary of Uttar Pradesh Alok Ranjan as saying. In the north-eastern Assam state, the water level has risen to alarming levels in the Brahmaputra and its tributaries, flooding large areas and killing one person, reports the Press Trust of India. The Kaziranga National Park and the Pobitora Wildlife Sanctuary are also heavily flooded, forcing animals to move to highlands to protect themselves, the agency added. 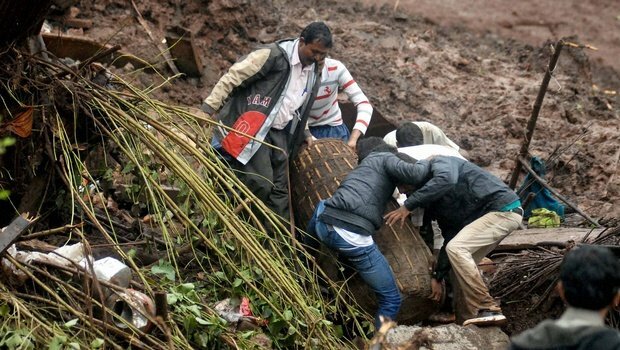 Indian rescue teams are working to locate survivors of a landslide that has claimed at least 23 lives and buried up to 200 people near the city of Pune in Maharashtra state. Ten people have been rescued from the wreckage in Malin village. Teams worked through the night but rain was hampering efforts to search for scores of people presumed trapped under the mud and debris. The landslide hit the village early on Wednesday while people were sleeping. Landslides are common in some parts of India during the monsoon, which runs from June to September. 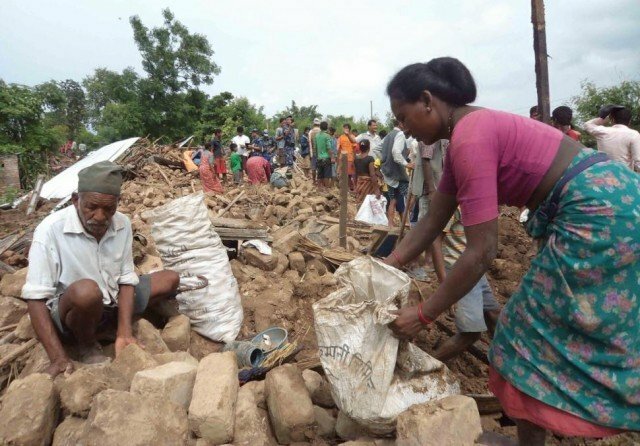 A large part of a nearby hill collapsed on Malin, and its population of 150 to 200 tribal people were covered with tonnes of loose earth, mud and rocks. “Everything on the mountain came down,” said Suresh Jadhav, a district official, describing how a cascade of mud, rocks and uprooted trees swamped the area. Rescue operations were disrupted on Thursday morning after “very heavy rainfall” in the area, Tripti Parule, a spokesperson for India’s National Disaster Response Force said. Maharashtra Chief Minister Prithviraj Chavan told the Press Trust of India news agency that more than 160 people were believed to be trapped in 44 houses buried under the rubble. The Indian Express newspaper reported that a 25-year-old woman and her six-month-old baby were among the 10 people who had been rescued from the site. “The woman and her baby were trapped in their house under the thatched roof… The mother was tightly holding the baby in her arms,” Baban Kokane, the driver of the rescue vehicle, told the newspaper. PM Narendra Modi described the loss of lives in the landslide as “saddening”. Home Minister Rajnath Singh is travelling to Pune on Thursday to assess the situation. 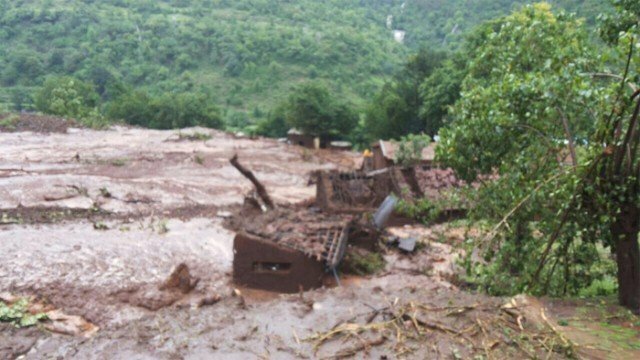 A massive landslide buried a remote village in western India on July 30, killing at least 17 people, officials said. The landslide buried some 40 houses and trapped about 150 people in Malin village, near the city of Pune in Maharashtra, officials say. Teams of emergency workers have so far rescued six people. Rescuers trying to reach survivors caught under the debris are being hampered by bad weather. The landslide hit the village early in the morning while people were sleeping. The whole village except its school has been washed away or buried. Landslides are common in some parts of India during the monsoon rains, which run from June to September. An official from India’s National Disaster Response Force (NDRF) said hilly terrain was making rescue work difficult. PM Narendra Modi described the loss of lives in the landslide as “saddening”. Narendra Modi said Home Minister Rajnath Singh would travel to Pune to assess the situation. Afghan rescuers have given up hope of finding any more survivors in a double landslide that is feared to have killed more than 2,500 people in Badakhshan. 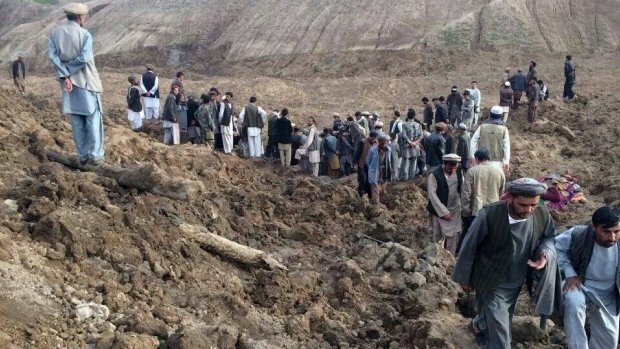 They have stopped digging through the earth and mud that swamped a whole village in the remote north-east province of Badakhshan on Friday. Officials now say the site has become a mass grave for the village of Ab Barik. Aid, including tents, food and water, has begun to arrive for the survivors. They spent Friday night camped out in near freezing conditions on the open hillside. Heavy rain is believed to have triggered Friday’s two landslides, the first of which buried hundreds of homes and the second then killed rescuers who had arrived at the scene to help reach survivors. Attempts to dig through the thick mud to find survivors continued into Saturday, with people using shovels and even their bare hands. But the last of the diggers had given up by later on in the day, realizing their efforts are futile, our correspondent reports. “We cannot continue the search and rescue operation anymore, as the houses are under metres of mud,” provincial governor Shah Waliullah Adeeb said. The landslide buried around 370 homes, which officials say housed in total some 2,500 people. The UN says only 350 bodies have so far been recovered. The landslides hit on Friday morning, a day of rest in Afghanistan, meaning whole families would have been at home at the time. After the first landslide struck, residents from a neighboring village came to the rescue only to be caught by a second landslide that brought down the entire side of one hill and thousands of tonnes of mud and earth. Continuing rain has raised fears of further landslides. Badakhshan is in the most remote and mountainous part of the country, bordering Tajikistan, China and Pakistan. It is one of the poorest regions in one of the poorest countries. Another, smaller landslide was reported in Badakhshan on Thursday. 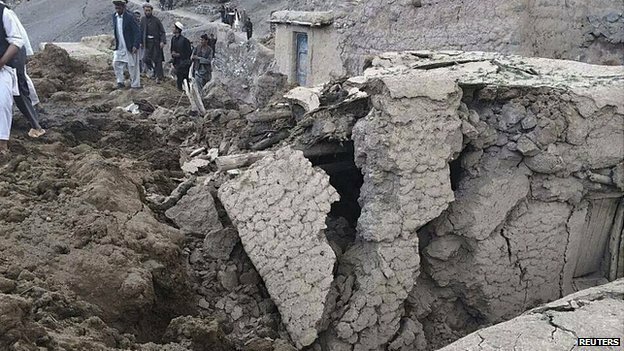 According to the UN mission in Afghanistan, at least 350 people have been killed and more than 2,000 are missing after a landslide hit the north-east province of Badakhshan. Hundreds of homes were buried under mud and rocks when a section of a mountain collapsed following torrential rain. Rescuers have reached the area and are searching for survivors. Much of north and east Afghanistan has been hit by heavy rain in recent days, and some 150 people have died in flooding. “The number of deceased has increased to 350 and significant displacement is expected,” the UN mission in Afghanistan said in a statement. Local officials say that more than 2,000 people are missing. About 1,000 houses were affected – 300 of them buried immediately after the side of a mountain gave way. As it was Friday morning, a day of rest in Afghanistan, people were at home and whole families were lost under tonnes of mud. Searching for survivors is a huge task, our correspondent adds. The governor of Badakhshan province, Shah Waliullah Adeeb, told AP news agency that rescue crews did not have enough equipment and appealed for shovels. “It’s physically impossible right now,” Shah Waliullah Adeeb said. Shah Waliullah Adeeb said that residents of nearby villages had been evacuated amid concerns about further landslides. The latest three victims of the Washington mudslide have been formally identified. The Snohomish County Medical Examiner’s Office positively identified the three people Thursday as Ron deQuilettes, 52; Sandra Miller, 64, and Wyatt Ruthven, 4. They are among the 39 victims recovered from the March 22 slide that swept through the community of Oso. Sandra Miller was building a new home on the banks of the Stillaguamish River with her husband, Larry, 58. The couple was putting finishing touches on the house before moving in, and Ron deQuilettes was there to work on the home’s electrical wiring. Ron deQuilettes leaves behind a wife, who he met 31 years ago, and four children. Wyatt Ruthven was among three generations of family who died in the mudslide, including his parents, Shane and Katie Ruthven, his 6-year-old brother Hunter and his grandparents Louie and JuDee Vanderburg. Each was previously identified as a victim of the slide. The Snohomish County Medical Examiner’s Office said they are still working with the families of the remaining missing. The bodies of two more people killed in the massive mudslide in Washington have been recovered by authorities, bringing the death toll to 16. The officials said they thought they had located eight more bodies under the mud but were unable to retrieve them. As many as 176 people remain unaccounted for. A 177ft wall of mud buried the town of Oso, north of Seattle, on Saturday. Officials said the search would resume at first light. “We haven’t lost hope that there’s a possibility that we could find somebody alive,” local fire chief Travis Hots told reporters on Tuesday night. “We are coming to the realization that that may not be a possibility – but we are going full steam ahead. The sudden, catastrophic mudslide on Saturday destroyed about 30 houses, temporarily damming a river and leaving a square-mile field of muck and debris in its wake. Survivors were last pulled alive from the mud on Saturday. But as many as 200 search-and-rescue workers at a time – aided by dogs, helicopters, laser imaging and excavation equipment – have not let up since, pausing only when darkness made the work too dangerous, officials said. The search-and-rescue operation was further complicated on Tuesday by heavy rain, Travis Hots said, as the workers were forced to contend with slippery mud, upturned nails, wreckage, and deep pits of water. President Barack Obama has called on Americans to pray for the victims of the landslide in Washington which has claimed at least 14 lives. 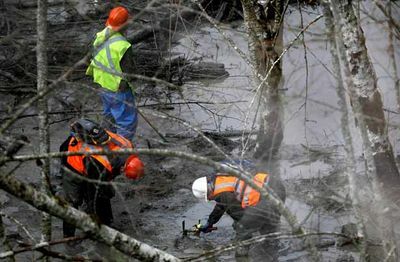 Officials say as many as 176 people remain unaccounted for after the 177ft wall of mud hit near the town of Oso, north of Seattle, on Saturday. Emergency officials said they expected the death toll to rise throughout Tuesday as they comb the debris field. Search crews have worked day and night, using helicopters and laser imaging. “The total fatality rate remains at 14 and we’re expecting that number to go up throughout the day,” local fire chief Travis Hots told reporters on Tuesday. At a news conference in the Netherlands earlier, Barack Obama asked all Americans to send their thoughts and prayers to the victims. “We know that part of this tightly knit community has been lost,” he said. Barack Obama has declared an emergency in Washington State and ordered federal authorities to co-ordinate the disaster relief effort. 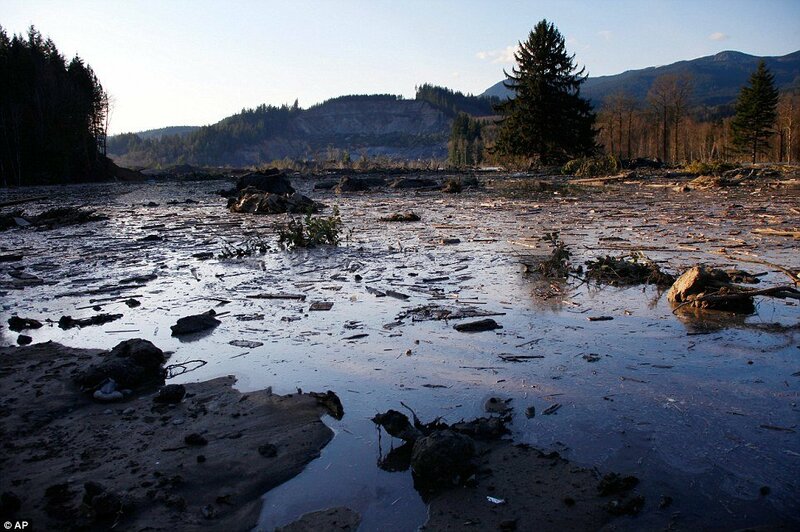 Washington Governor Jay Inslee – after surveying the area from the air – said it was “devastation beyond imagination”. Jay Inslee said the slide “basically cut a mountain in two” and deposited it on the town below. Nothing in the path of the slide was still standing. Family members and volunteers were using chainsaws and their bare hands to shift the wreckage and try to find those missing. Snohomish County emergency management director John Pennington has said the official list of the missing stood at 176. About 30 homes were destroyed and more than half the town of Oso is missing – a recent census put its population at 180. Washington authorities have found six more bodies after Saturday’s huge landslide, bringing the number known to have been killed to 14, say police. Officials now say as many as 176 people may remain unaccounted for after the 177ft wall of mud hit near the town of Oso, north of Seattle. Officials admit they have little hope of finding survivors. President Barack Obama has declared an emergency in Washington State and ordered federal authorities to co-ordinate the disaster relief effort. Speaking earlier after surveying the area from the air, Washington Governor Jay Inslee said it was “devastation beyond imagination”. “It’s that absolute devastation that causes us all real pain,” he said. At a news conference on Monday evening, Snohomish County emergency management director John Pennington said the official list of the missing stood at 176. But he said he did not think the final death toll would be so high, because some of those listed as unaccounted for would be found to be alive, and other names would prove to be duplicates. But he said authorities no longer expected to find survivors in the debris. “We as a community, we as a county, are beginning to realize that we are moving toward a recovery operation,” John Pennington said. 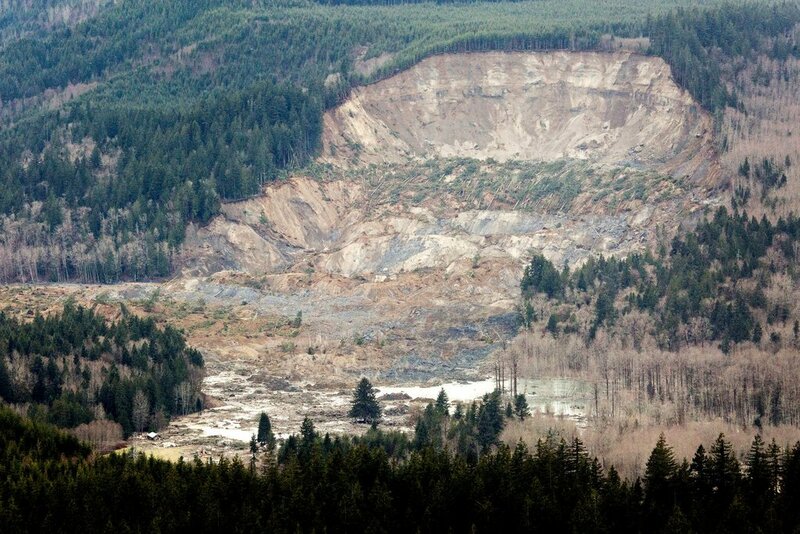 The landslide left behind a cliff known as a head scarp 600ft high, Washington state geologist Dave Norman told reporters on Monday afternoon. Authorities have continued their search-and-rescue operations amid a tangled, water-logged field of mud and debris, using rescue dogs, aerial photography and laser imaging to help the search. Officials said the conditions were treacherous, and the threat of further landslides on Monday forced the authorities to pull rescue workers back from the scene briefly until scientists determined there was no further risk. More than 30 homes were destroyed and more than half the town of Oso is missing – a recent census put its population at 180. The landslide cut off the city of Darrington and clogged the north fork of the Stillaguamish River. 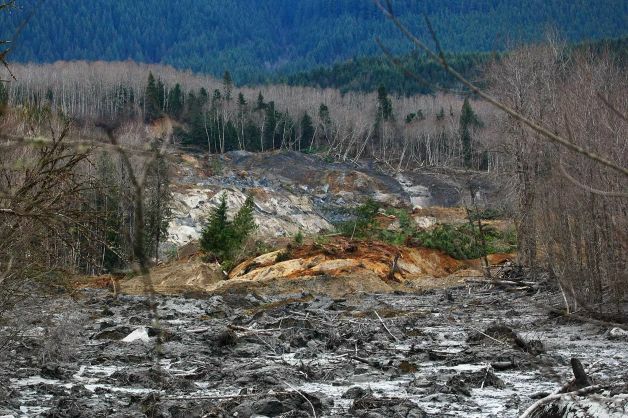 At least 108 people are reported missing or unaccounted for after Saturday’s huge landslide in the north-western Washington. 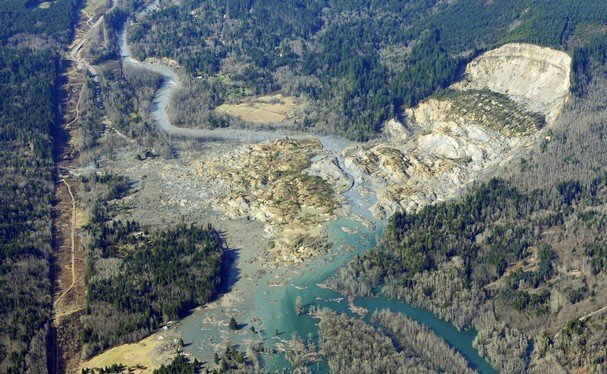 Eight bodies have been recovered so far after the 177ft deep wall of mud swept near the town of Oso, about 55 miles north of Seattle. Search crews have worked day and night, using helicopters in the dangerous conditions that destroyed 30 homes. Several people, including an infant, were critically injured. Snohomish County emergency management director John Pennington said the figure did not necessarily represent the total number of injuries or fatalities. John Pennington said the list had been consolidated from a number of sources. Authorities have continued their search-and-rescue operations amid a tangled debris field that Washington Governor Jay Inslee labeled “a square mile of total devastation”. This prompted fears of severe flooding downstream if the build-up of water behind the debris breaks through suddenly. The authorities say the landslide was caused by recent heavy rain. The area has had problems in the past with unstable land. 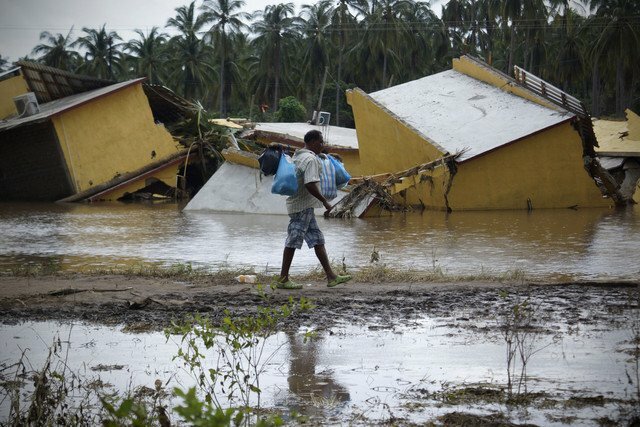 The death toll of Tropical Storms Manuel and Ingrid in Mexico now stands at 110, the interior minister says. Another 68 are still missing, believed dead, after a landslide destroyed the village of La Pintada in western Guerrero state. President Enrique Pena Nieto asked Congress to increase the federal budget in light of the emergency. Officials are still trying to evaluate the total extent of the damage. “We are confronting rainfall that has practically been the most extensive in the history of the entire national territory,” President Enrique Pena Nieto said on Sunday. Interior Minister Miguel Angel Osorio Chong said work was under way to establish which areas were worst affected by Tropical Storm Manuel which hit Mexico’s western coast, and Ingrid, which made landfall on its eastern coast last week. Twenty-four out of Mexico’s 31 states have been affected by the twin storms. “There’s no point in the government offering us kind words and nothing else,” Alicia Sanchez told the Associated Press news agency. “They’ve made us promises but I don’t think they’ll keep them,” the Acapulco resident said. Acapulco’s international airport re-opened for commercial flights on Sunday, a week after it had to close due to power cuts and flooding. Some 20,000 people are still living in shelters in the surrounding state of Guerrero. Rescue workers continue to search the rubble and mud for bodies of those buried in a landslide in La Pintada, where some 40 homes were swept away by mud from a hillside. Touring the site of the disaster on Saturday, President Enrique Pena Nieto said there was little hope of finding anyone alive. Lt Carlos Alberto Mendoza, who is leading the team of soldiers searching La Pintada, said it was the most daunting task he had faced in more than two decades of service. “They are doing unbelievable work, hours and hours for just one body,” he said of his team of 16 soldiers. “No matter how hard the day is, they never get tired of working,” he added. Continuing rainfall is putting the rescue workers at risk of renewed landslides. Five police officers died on Thursday when their Black Hawk helicopter crashed into a hillside on its way to La Pintada. A total of 1.2 million people were affected when Tropical Storm Manuel made landfall on 15 September on Mexico’s south-western coastline. More than 25,000 tourists had to be airlifted out of Acapulco after the beach resort was cut off. Just 24 hours after Manuel had made landfall, Tropical Storm Ingrid hit the country’s Gulf coast, causing destruction in Verazcruz and Tamaulipas. After temporarily weakening, Manuel regained strength and hit Mexico’s north-western coast with hurricane-strength winds and more rain on Thursday. Forecasters say rains will continue to fall on the Gulf Coast of Mexico and the country’s interior until Tuesday. 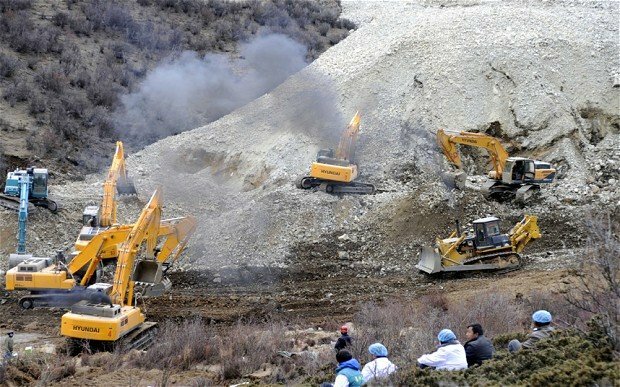 Tibetan rescue teams are searching for 83 miners buried in a landslide in Maizhokunggar county on Friday. The chances of finding survivors at the mine near the Tibetan capital, Lhasa, were slim, Chinese media quoted rescuers as saying. The miners’ camp, at an altitude of 15,000 ft, 45 miles east of Lhasa, was destroyed by thousands of tonnes of rock. Rescuers have been hampered by freezing weather, altitude sickness and risks of further landslides. Xinhua news agency said that as of 10:00 local time no survivors had been found. “The miners’ survival chances were slim due to the scale of the landslide,” it quoted one rescue worker as saying. Some 2,000 police, firefighters and doctors have been sent to the disaster site, setting up temporary accommodation at a safe distance. About 200 bulldozers have been deployed to shift rock. Xinhua said cracks on nearby mountains suggested there could be further land slips. “Temperatures as low as -3C have affected the sniffer dogs’ sense of smell,” it added. More than 300,000 cubic meters of debris had been removed by midday on Saturday. The Maizhokunggar mine, which produces copper, as well as some silver and gold, is operated by a subsidiary of state-owned China National Gold Group, China’s biggest gold producer. Chinese President Xi Jinping is said to have ordered authorities to “spare no efforts” in the rescue operation. Most of the workers were ethnic Han Chinese from Yunnan, Guizhou and Sichuan provinces, with two reported to be ethnic Tibetans. Police said the area that collapsed was up to 1.5 sq miles. Chinese officials believe the Tibetan plateau has huge resources, including millions of tonnes of copper, lead, zinc and iron ore. Critics claim that Beijing’s interests are driven by a desire to exploit the region’s rich mineral wealth. The government argues its investment brings modernization and better living standards for local Tibetans. The landslip came on the same day as a gas explosion at a coal mine in north-eastern Jilin province. Some 28 people were killed at the Babao mine in the city of Baishan. Another 13 miners were rescued after the explosion. A landslide in south-western China has buried at least 19 people, 18 of them children, local officials say. A school house and two farm houses were buried when the landslide struck a village in Yunnan province early on Thursday, the local government said. Rescue teams were on their way to the site, the statement said. A series of earthquakes, including one of 5.8 magnitude, hit the province on 8 September, killing dozens of people. The landslide happened at 08:00 local time. It buried the Youfangtai Primary School in the village of Zhenhe, in Yiliang County, Zhaotong City, according to a statement from Yiliang County officials. Li Zhong, head of Yiliang’s education bureau, said that the students were at school during the national holiday to make up for classes suspended after the September earthquake, reports the China News Service. A family of three people had managed to flee before the landslide hit, said state-run Xinhua news agency. Other residents had also been moved to safer places after the landslide, it added. An enormous stretch of coastal road collapsed into the Pacific Ocean Sunday, and left a gaping hole where the road once was, after a large rainstorm in San Pedro. The coastal road, located along an 800-foot section of Paseo del Mar in San Pedro, had been closed to traffic for several months as the road sunk and shifted. Signs also served as a warning to residents to stay away from the unstable section. Peter Sanders, spokesman for Mayor Antonio Villaraigosa, says the road is likely irreparable, and that plans for a new roadway must now be considered. 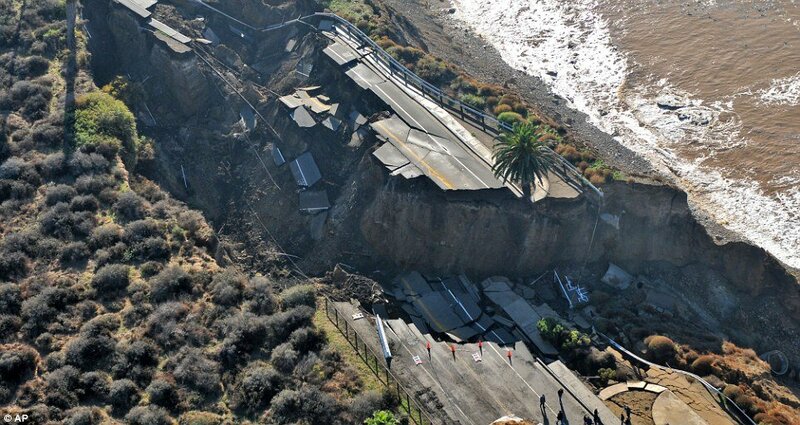 It was reported that no one was injured and no homes were directly in the path of the San Pedro landslide. Knowing the enormous landslide may be a temptation to adventure seekers and the insatiably curious, Los Angeles City Attorney Carmen Trutanich has assigned the LAPD to patrol the area overnight. “Because this is such a new thing, there are going to be a lot of looky-loos out here,” Carmen Trutanich told one worker. An 8-foot chain link fence was installed around the most dangerous parts of the landslide. Visitors and residents of the area came out in the pouring rain to observe the sight. The landslide began late this summer at a very gradual pace. At the beginning of November, the road was moving at a rate of about half an inch a day, according to geologists. Then fissures began appearing more frequently, and the road started to buckle. According to engineers the landslide is moving nearly four inches a day – vertically and horizontally – widening the fissures and dropping chunks of roadway and dirt into the ocean. The road runs south of downtown Los Angeles along the coast of the Pacific Ocean, and served as a place for nearby residents to walk their dogs and cycle along the bluffs. Peter Sanders says a geological firm has been hired to study the cause of the landslide, which will take around seven months to complete. Some experts say that the continued popularity of building homes near the bluffs merely exacerbated the problem of landslides in the area.